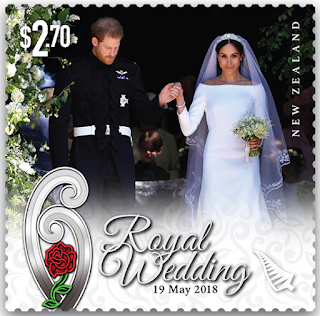 Virtual New Zealand Stamps: 2018 The Royal Wedding. Early this evening, (Sun 20th May 2018) I got a text from our blog owner, Allan. 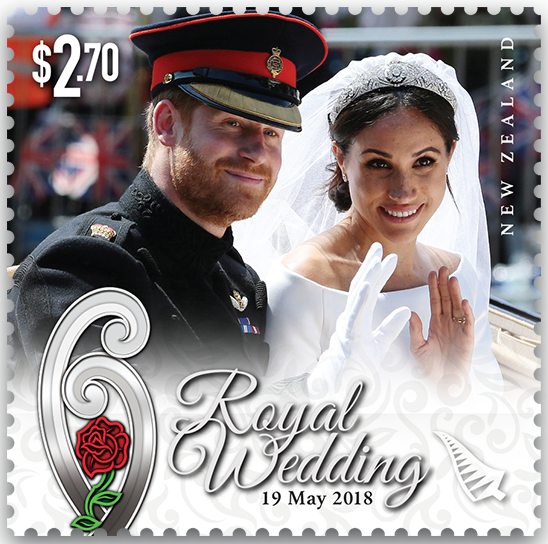 "NZ Post just issued stamps for Royal Wedding. Do you want to run with it? Min sheet and six stamp images in our drop box. Allan." Millions around the world watched and celebrated as His Royal Highness Prince Henry of Wales and Ms Meghan Markle wed on 19 May 2018 at St George’s Chapel, Windsor Castle. New Zealand Post is honoured to mark this special occasion with celebratory stamps. Last night, we held a Royal Wedding Party and some of us watched well into the early hours of the morning. The day was beautiful and the wedding set in the chapel of a historic English castle. It was the true fairy story where the girl from America found and married her real prince. This wedding was different from the formal wedding of William and Kate, held in the centre of London in 2011. It was less formal, held in Windsor Castle rather than London. I felt it fitted the couple so well. Some have said her dress was plain and she wore hardly any jewellery but couldn't that be what she intended? This couple is no longer in the direct line to the throne so in many ways will have a freedom that William and Kate will never have. It seems like the Queen cut them some slack and allowed the royal protocol to be bent a bit too. But for a wedding of a modern couple in a family steeped in traditions, I think they got the balance about right. We enjoyed those special moments of the wedding. The looks between them all the way through the wedding service. That look on the young page boy as he saw inside the chapel. It was like, "Wow!" The first married kiss. (I don't think it was as good as Kate and William's) The sermon by the charismatic preacher from the USA. I think he might have shocked a few royals. Ha! Ha! Those beautiful horses pulling the carriage. Yes, they know how to do it with flare in England. Also, see 2018 Royal Visit. 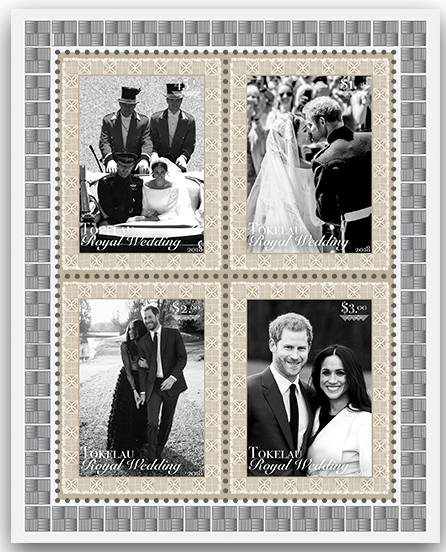 The 2018 Royal Wedding mint stamp sheet features six stamps depicting Prince Harry and Meghan Markle: two from the official engagement shoot, and four specially selected images of the happy couple on their wedding day. The six stamps can only be purchased as part of this special miniature sheet. 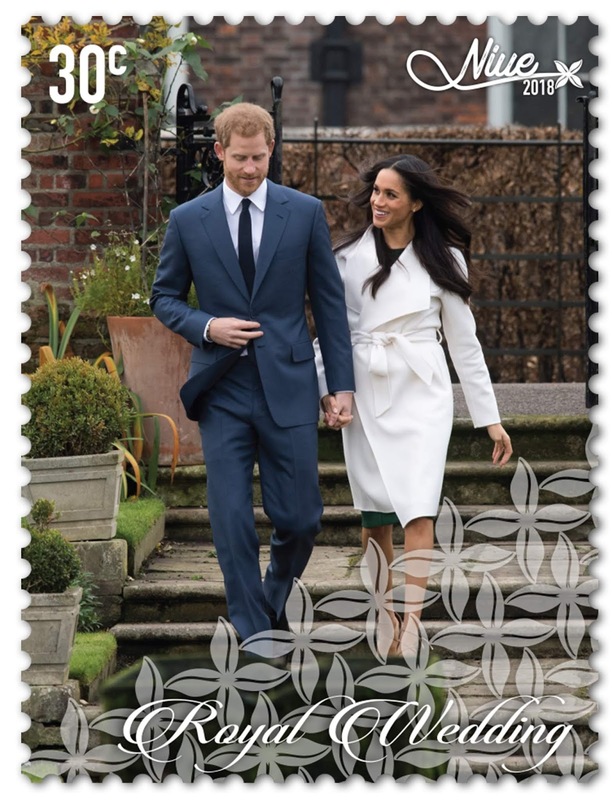 There are no official captions for these stamps. Two photos from the Offical Engagement Shoot. $2.70 - A Special Moment. Four photos from the Wedding. $2.70 - Exchanging Wedding Vows. $2.70 - The Kiss on the Steps of St George’s Chapel, Windsor Castle. 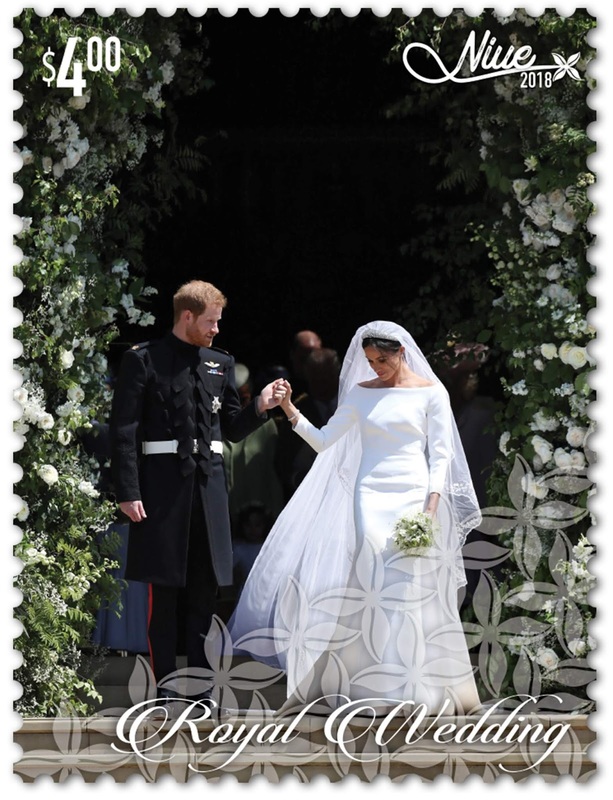 $2.70 - Leaving the Chaple as Duke and Duchess of Sussex. $2.70 - Horse-drawn carriage ride through the village of Windsor and back to the castle. I'm happy he was allowed to keep the beard - looks handsome like that. 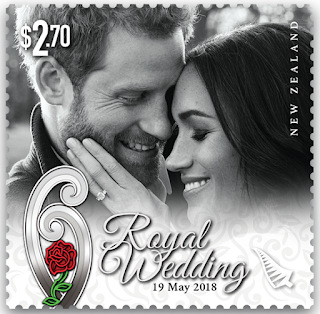 I think something needs to be said about how quickly NZ Post had these stamps ready to order. By 10am the following morning NZST, possibly while the champagne was still flowing at the evening wedding reception. The Stamps and Coins team had worked through the early hours to deliver a set of stamps that showed the happy couple on their wedding day. Artist Dave Burke selected images from the wedding as they were released and designed the resulting stamps and commemorative sheet. Later in the morning, TVNZ arrived to film a piece on the team's efforts which featured on One News that evening. Well done guys! An amazing effort to create and a great set of stamps! Date of issue: 21 May 2018. Stamps designed: Dave Burke, Auckland, New Zealand. Printer and process: Collectables and Solutions Centre, New Zealand Post, Whanganui, New Zealand. Stamp size and format: 36.95mm x 37.5mm (vertical). Sheet size: 260mm x 170mm. The number of stamps per sheet: Six. Perforation gauge: 14.4 x 14.615. Period of sale: Unless stocks are exhausted earlier, these stamps will remain on sale until 20 May 2019. Here is something a little bit different for this blog - the 2018 Royal Wedding stamps of Niue and Tokelau. 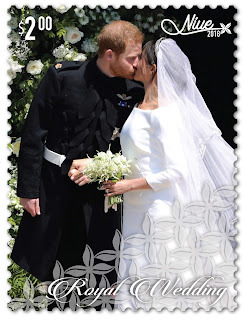 Millions around the world watched and celebrated as His Royal Highness Prince Henry of Wales and Ms Meghan Markle wed on 19 May 2018 at St. George’s Chapel, Windsor Castle. 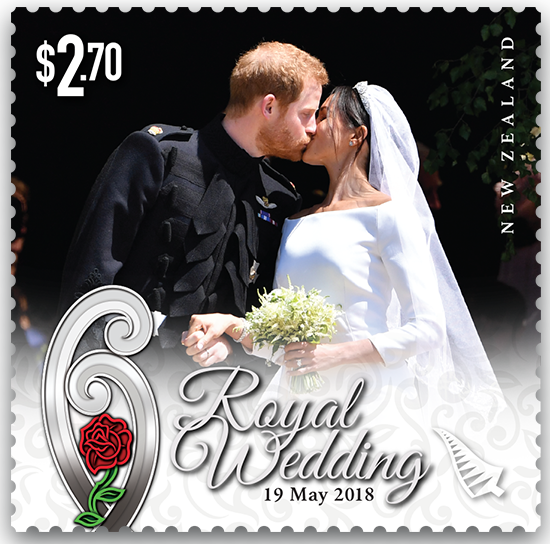 This issue from Niue features four stamps: two of the couple celebrating their engagement, and two of their wedding day. These were pleasing stamps with nice photographs. The stamps delivered their message too with the name "Niue" and the value clearly seen. 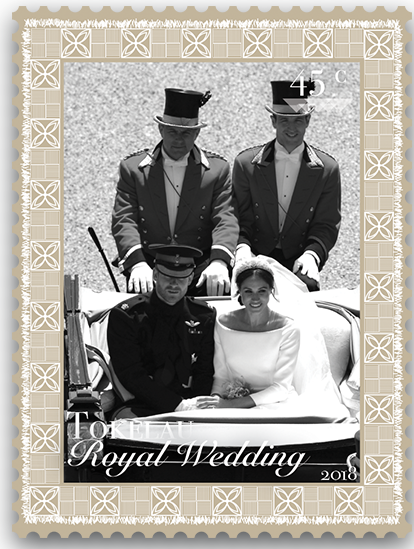 The word "Royal Wedding" was partly lost in the photographed image but still readable. 30c - 2018 Niue Royal Wedding. 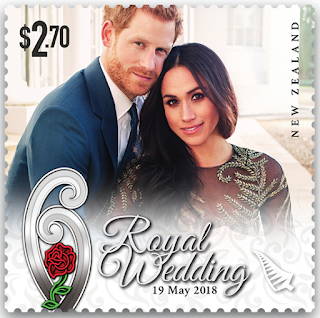 $1.40 - 2018 Niue Royal Wedding. 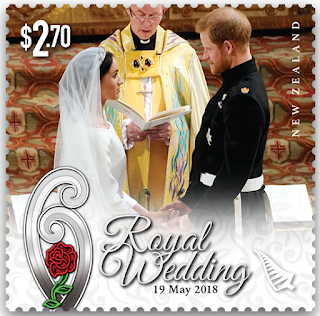 $2.00 - 2018 Niue Royal Wedding. $4.00 - 2018 Niue Royal Wedding. 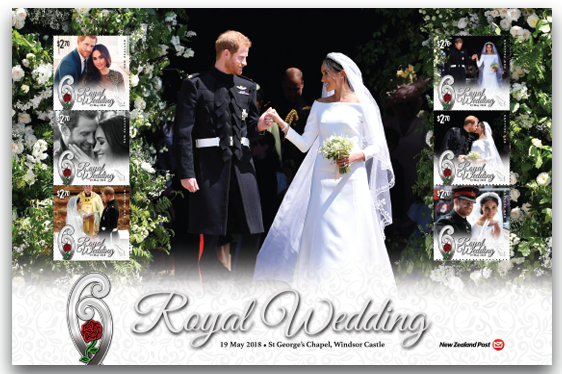 2018 Niue Royal Wedding - Miniature Sheet. 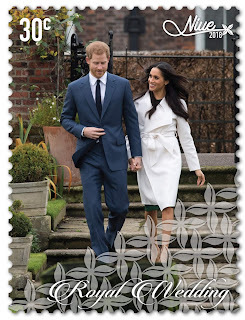 I was a bit disappointed with the miniature sheet for both of these issues as they seemed to be nothing more than the four stamps surrounded by a fancy border. The number of stamps: Four gummed stamps. Denominations: $0.30, $1.40, $2.00 and $4.00. Stamps, miniature sheet and first day covers designed: Saint Andrew Matautia, New Zealand Post, Wellington, New Zealand. Stamp size and format: 40mm x 30mm (horizontal). The number of stamps per sheet: 16. Special blocks: Plate and value blocks may be obtained by purchasing at least six stamps from a sheet. Period of sale: Unless stocks are exhausted earlier, these stamps will remain on sale until 21 May 2019. Millions around the world watched and celebrated as His Royal Highness Prince Henry of Wales and Ms Meghan Markle wed on 19 May 2018 at St. George’s Chapel, Windsor Castle. 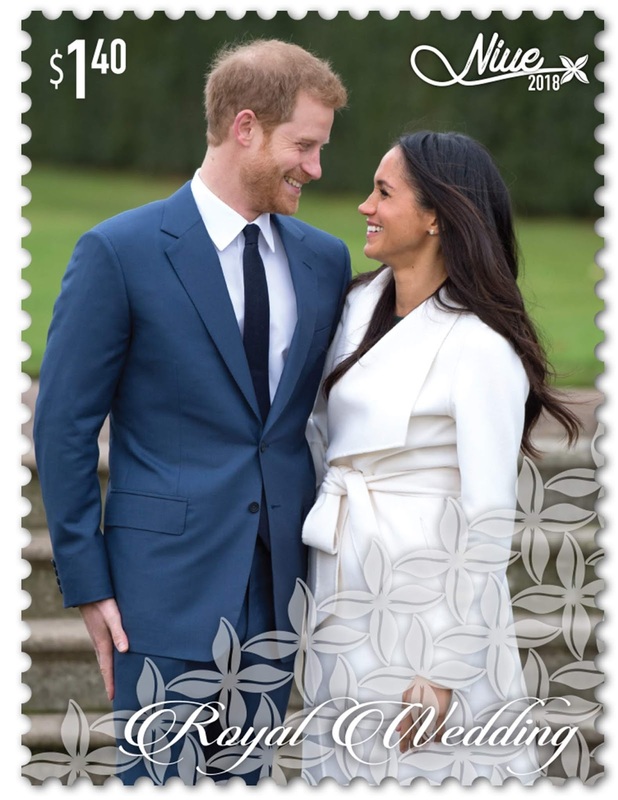 This issue from Tokelau features four stamps: two of the couple celebrating their engagement, and two of their wedding day. Again, nice photographs were chosen for these stamps but I think the black and white format let them down as their text has become lost in the photographed image and hard to read. 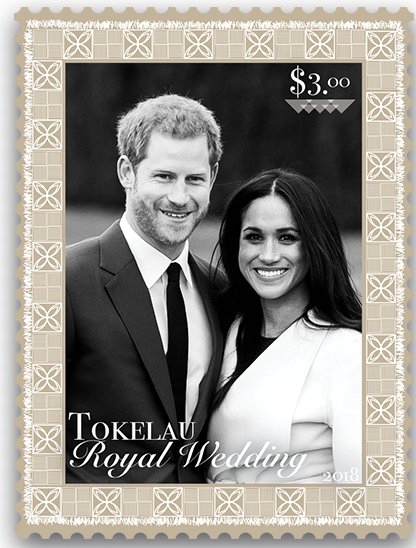 45c - 2018 Tokelau Royal Wedding. 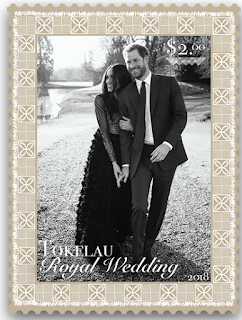 $1.40 - 2018 Tokelau Royal Wedding. $2.00 - 2018 Tokelau Royal Wedding. $3.00 - 2018 Tokelau Royal Wedding. 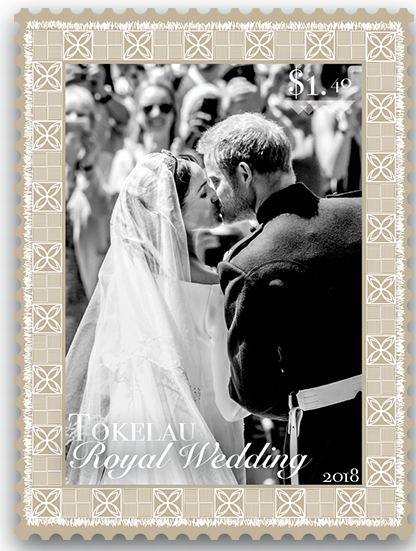 2018 Tokelau Royal Wedding - Miniature Sheet. Denominations: 45c, $1.40, $2.00 & $3.00. Special blocks: Plate blocks and value blocks may be obtained by purchasing at least six stamps from a sheet. This is an informative post on one of the better issues NZ Post have done recently.